Win a pair of tickets to the Lee Kong Chian Natural History Museum by voting for your favourite specimen! The museum is looking for new specimens to be featured on our next merchandise, and you have a say in what specimen would be used and win a pair of tickets to the museum in the process. 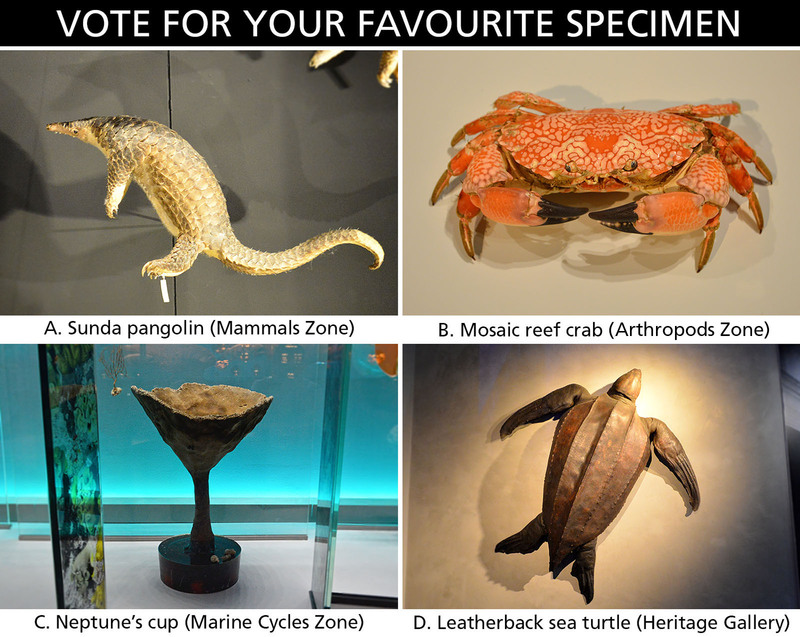 Simply hit “Like” and submit your vote for your favourite specimen as a comment on the contest post. The specimen with the highest vote will be chosen to be featured on our next merchandise. Only one vote per person is allowed. Be sure to “Like” our page and stay tuned to the results! Winners will be notified via Facebook message and on this page. Contest ends 6 Jul 2015 11:59 pm GMT+8. Two winners would be chosen at random. Prizes are not transferable or exchangeable for cash. Tickets must be claimed and collected from the LKCNHM counter by 31 Jul 2015. This contest is not open to LKCNHM staff, and is in no way sponsored, endorsed or administered by, or associated with Facebook.